Even though Winter doesn't officially start until December, here in Edinburgh we are already feeling the cold morning chill and our shops are already stocked full of christmas and winter clothes to keep us warm. Just because your garden may soon be devoid of colour this winter doesn't mean that your home flowers have to suffer. Being an online florist we have a selection of recommended winter flowers for your home including everything from Roses, Germini and Carnations. Our flowers will give your home a splash of colour to carry you through Winter and delivered to you fresh. Some of our popular and easy to maintain flowers include the Winter Sunshine Bouquet which is a colourful combination of Scented Lilies, Geberas and Pink Roses for an eye catching display. 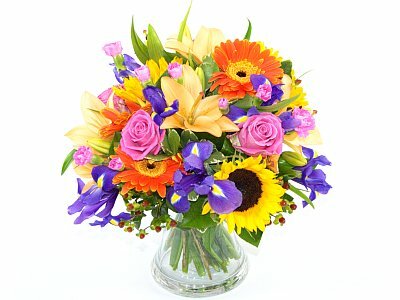 This sunshine bouquet is carefully hand arranged and boxed to arrive with you fresh and in excellent condition, and helps add a warm tone to your home bursting with colour. 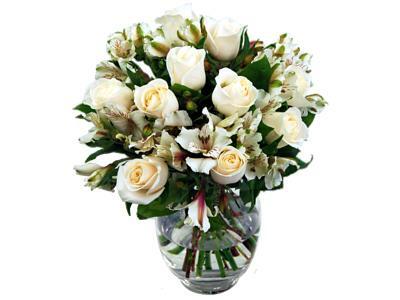 We also have the White Rosmeria Bouquet available which adds a distinctive crisp refreshing, feel to your home. This bouquet is a perfect gift for friends or as a treat for yourself, and the bouquet is made with a dozen freshly cut White roses upon a green backdrop. We can also include a handwritten note with this bouquet for writing a festive winter greeting.